View our list of current vacancies at our Dublin hospital. Located close to the gates of Cavan General Hospital on Farnham Road, the clinic enables patients from Cavan / Monaghan and surrounding areas to have easier access to some of the country’s leading Medical and Surgical consultants without a need to travel to Dublin or other large centres. Patients referred by their GP are assessed in the Cavan Clinic and any follow-up consultations will take place there, significantly reducing the travel time and associated costs for patients. Where a procedure may be required, this will take place in the Bon Secours Hospital Dublin which is conveniently located 90 minutes from Cavan Town and just off the M50 (exit 5). The opening of the clinic is a very exciting time for the Bon Secours Health System which is well known throughout Ireland for providing Advanced Medicine and Exceptional Care. In keeping with our founding mission, the opening of the Cavan outreach clinic brings us back to working more closely within communities and we look forward to welcoming patients from Cavan / Monaghan and the surrounding area to our Cavan Clinic. Also provided on-site are the following diagnostic services - Duplex Ultrasound (incl. ABI if rquired), Cardiac Echo, ECG, Holter Monitor and Ambulatory Blood Pressure measurement. On the days when theCardiology and Vascular clinics take place, there is also a Cardiology Physiologist and Vascular Technican on-site who perform the following diagnostic tests as requested by the Consultant - Duplex Ultrasound ( plus ABI if required), Cardiac Echo, ECG and who also fit for Holter and Blood Pressure Monitoring. A GP referral is required to make an appointment to see one of the specialist team at the clinic. Once you have your GP referral please contact Sarah in the clinic and she will arrange an appointment for the next available clinic. Where your GP sends your referral directly into the Clinic, Sarah will contact you to arrange an appointment. Some medical insurance packages tmay have an allowance towards Consultant fees. In all cases you will be required to pay the fees on the day of visiting the clinic and you will be provided with a receipt which you can submit to your insurance company or claim back against your personal taxes at the end of the year using a Med 1 form. ( downloadable here). In the event where patients to the Cavan Clinic may require a procedure, this will be carried out at the Bon Secours Hospital Dublin. 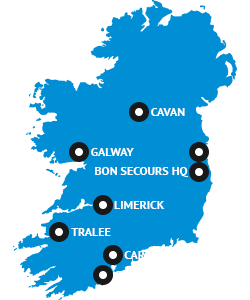 The Bon Secours Hospital Dublin and the other Hospitals in the group have negotiated excellent rates and coverage with all the private health insurance companies and have some of the best coverage available amongst private hospitals across the country. For those patients who may not have health insurance, we also have a self pay option for procedures. For more details about these Self Pay prices, please contact 01 8065351.